This is one of my favourite paintings. 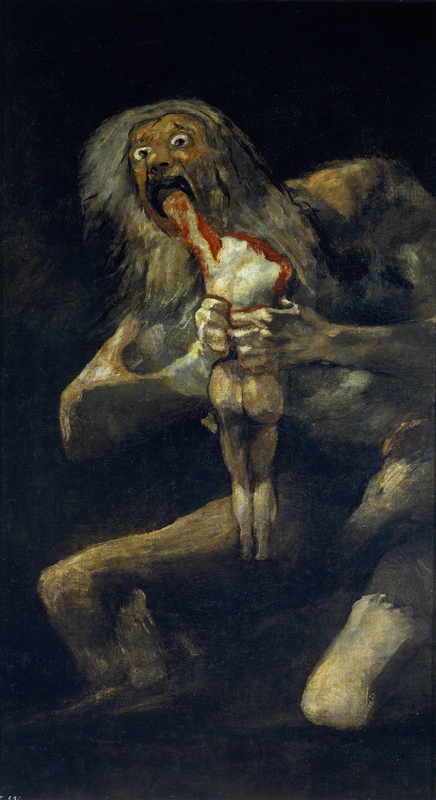 It’s unofficially called ‘Saturn Devouring His Son’ by Francisco de Goya, part of a series now referred to as ‘the Black Paintings’, never given official names by Goya. A few years ago I was reading about cannibalism having re-watched Silence of the Lambs and read Hannibal Rising. This artwork came to my attention then, reading about the history of human cannibalism. I couldn’t take my eyes off the screen. 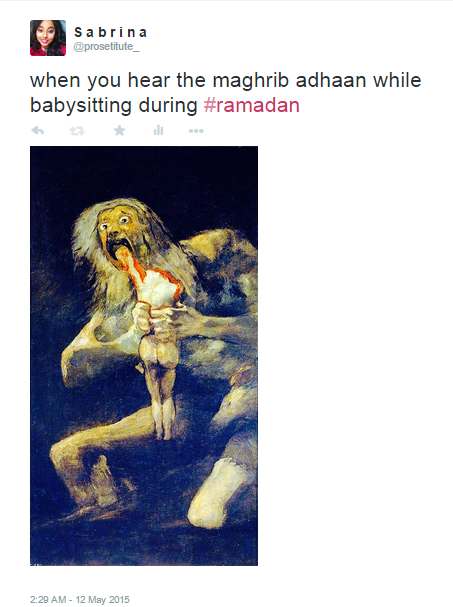 I felt so mesmerised by the horrific depiction. It was so cold and brutal. Saturn’s wide eyes chilled me to my core, and the way his infant is limbless, beheaded and bleeding certainly enhances the terror of the scene. Although this has been a favourite artwork for years, I only researched it properly this year and the contextual information around it fascinated me deeply. I’m no art history buff but the subject matter and artist’s life are very interesting. Saturn, the God of Time, hears a prophecy that one of his sons is to dethrone him, and so he devours each one as they are born – but one escapes: Jupiter. Eventually in an ironic twist of causality, Saturn is dethroned by Jupiter despite trying to stay in power. He cannot escape his allotted fate. This painting is viewed by some art historians as allegorical because of Goya’s political views of how political powers turn on their own charges and “children”, and also in regards to the cyclical nature of life, power and time. I love the eerie aesthetic Goya uses here, because he shows us a basic physique of Saturn… and it’s whitish like bone, and sunken and rigid like bone… yet also dissolving. Saturn is deteriorating in physicality by his grotesque act. As Saturn butchers his own flesh and blood child, his own literal flesh and blood appears more clinical; bony and lifeless. There is a deep frenetic energy in this art in my opinion. Some historians believe Goya painted Saturn with an erection and that restoring the painting resulted in losing that depiction when taking it to the public. You’ll notice there is an extra piece of Saturn abnormally jutting out at his hip. The use of colour here (wow, I sound like an idiot talking about art probably haha) makes me feel paralysed with fear. I can’t look away from how Saturn and his son loom out of the darkness, as if they’re in a cave, far removed from civilisation, with Saturn feasting on his opportunity to retain power. The concept is utterly scary and the plausibility of it in a power-hungry society makes it a strangely evocative and worrying statement about human willpower and choice. Just look at Saturn’s bulging eyes and tightly grasping hands; he’s adamant that he won’t lose his throne… and he knows the nature of his actions is disgustingly deplorable. Goya captures this moment of insanity and desperation perfectly. Goya’s home just outside on the banks of the Manzaneres River (outside Madrid) named ‘Quinta del Sordo’ (meaning ‘Villa of the Deaf Man’) had these painted on the walls, sometime between 1819 and 1823. Goya left for France in 1823 and left his home to his grandson. Previous Post White chocolate panna cotta. Next Post Baked ricotta cheesecake. I loved the story and the myth already but then saw the twitter post and nearly died laughing !